Be both creator and designer by adding your own personal flair to any fabric project using homemade fabric paint. Fabric paint adds dimension to quilting projects, is beneficial for costume play -- cosplay -- creations, and useful for children’s art projects. Crafters of all skill levels can create fabric paints from ingredients they already have in their supply closet or by purchasing a few inexpensive ingredients. Use straight acrylic paint for cloth projects that do not require flexibility. Acrylic paint adheres well to fabric, but it can also stiffen fabric. Use an acrylic paint fabric medium in conjunction with acrylic paint to soften and extend acrylics for fabric projects such as T-shirts, baseball caps or blue jeans. Follow the directions on the package for the exact ratio of acrylic paint to fabric medium. The amounts differ depending on fabric medium brands. Pour a small amount of white all-purpose glue into a small container. Add powdered drink mix to the glue and mix thoroughly, or add a drop of food coloring in lieu of powdered drink mixture and mix well. The more food coloring you add the darker the paint will be. Store unused paint in an airtight container to prevent hardening. You can also just add more water to acrylic paints to dilute them, resulting in weaker fabric colors without all the stiffness. Place 1 quart of milk into a large bowl and add 1 tablespoon of lemon juice. Let the milk sit overnight so that it separates. Drain the separated milk through a cheesecloth. Discard the liquid and retain the curds. Mix 4 tablespoons of powdered pigment or powdered drink mix into the curds until they are well incorporated. If desired, use acrylic paint instead of the powdered pigments. 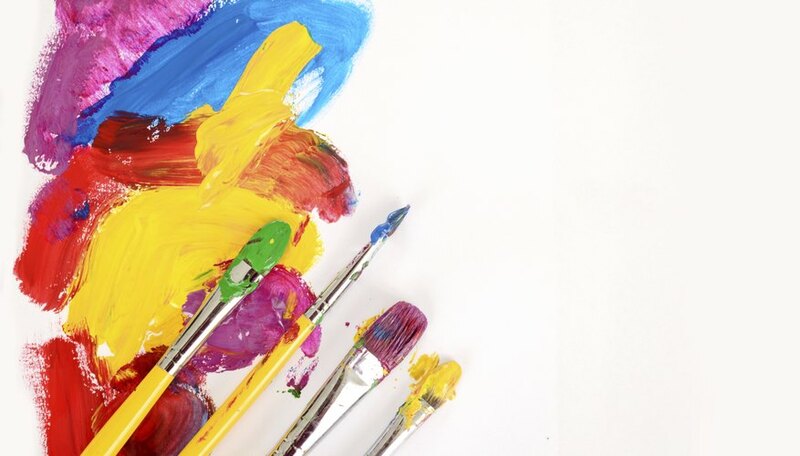 Add one drop of paint at a time until you reach your desired color. This paint does not store well and smells slightly sour, but the smell dissipates as the paint dries. Prewash fabrics before you paint on them, and use a cardboard insert between layers when painting fabrics that are multilayered, such as shirts. The cardboard insert prevents the paint from bleeding through the fabric onto the bottom layer of the fabric. Use stiff-bristled acrylic brushes or sponge brushes for best results. Expect to use a lot of paint. Fabric soaks the paint into it. After your project is complete, let it dry for 24 hours. Place a vinegar soaked rag over the paint and then iron the painting until the rag is dry. This helps to set the paint. Use the end of a cardboard toilet paper roll as a stamp, or make your own with foam cut into the desired shapes and glued to a backing you can grasp.